After months of build up from the Chinese company, a tremendous number of leaks, and endless hype, the OnePlus 6T has finally been officially announced. Something of an evolution of the OnePlus 6, the latest handset features a smaller notch, an in-screen fingerprint reader, and no headphone socket. With a starting price of $549 there's a lot to get excited about with the latest addition to the OnePlus range -- and the specs are certainly impressive. But for folks in the US who have been eagerly anticipating OnePlus handsets finally launching in their country, the wait is finally over. The OnePlus 6T will be available in the US as a T-Mobile exclusive. The screen of the OnePlus 6T is a 6.41-inch AMOLED affair; it has a resolution of 1080 x 2280 pixels, and a pixel density of 394 PPI. The handset measures 57.5 x 74.8 x 8.2mm and weighs 185g and is powered by a Qualcomm Snapdragon 845 SDM845 octo-core processor running at 2.8GHz. With up to 8GB of RAM and 256GB of storage, the 6T is up there with the big boys, and dual cameras offering 16 and 20MP will keep photographers happy. 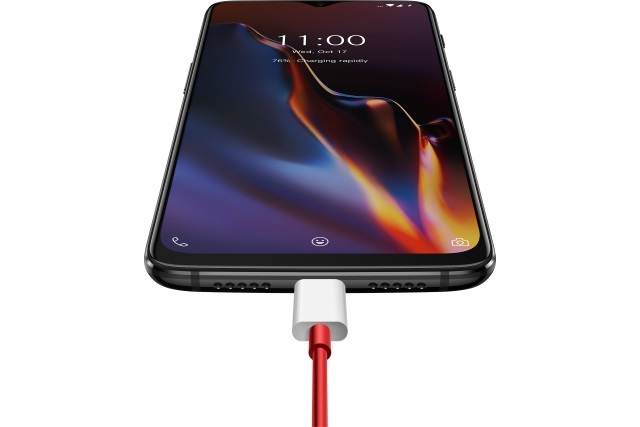 There is a 3700 mAh battery -- but no wireless charging -- and a dual Nano SIM that we've become used to from OnePlus. Despite the removal of the headphone jack, the extra space has not been used to add an extra speaker, so there is no stereo sound. It is interesting to note that in the box, there is a "Type-C to 3.5 mm Headphone Jack Adapter". Full specs can be found on the OnePlus website. Arguably, it is the arrival of OnePlus in the US that is the biggest news about this handset launch, and T-Mobile has not only an exclusivity deal, but also a special offer that means customers can buy the OnePlus 6T for less than half price. We've seen real demand for OnePlus smartphones at T-Mobile. Nearly 200,000 customers have already brought theirs to the Un-carrier -- paying full price up front -- before we even started carrying them. Wow! So, we did what we always do: listened and delivered by bringing the OnePlus 6T exclusively to our customers. The OnePlus 6T and T-Mobile's LTE network were made for each other -- blazing speeds, incredible value and a great customer experience! T-Mobile is the perfect wireless partner for us in the US. The OnePlus 6T clocks some serious speed, and we wanted our customers to unleash it on the fastest network in the nation. More details about the T-Mobile deal can be found on the T-Mobile website. A wealth of information about the new handset is also available on the OnePlus site.